As lightweight as possible and environmentally compatible – the demands placed on the cars of the future are increasing worldwide. There are a number of reasons for this, such as a growing scarcity of resources, coupled with a rapid rise in mobilization, especially in emerging markets. Subsequently, the need to reduce environmentally harmful carbon-dioxide emissions (CO2) per vehicle is also increasing. On top of this, the higher demands of consumers must also be considered. Today’s consumers want more efficient models that are also safe, provide a high level of comfort, and go easy on the environment. Meeting all these needs creates challenges for car manufacturers and suppliers. One key technology here is lightweight design, because as efficient as a combustion engine these days may be, in the long run, automakers will most likely be able to cut the fuel consumption of gasoline- and diesel-powered vehicles further by reducing overall vehicle weight. In this matter, LANXESS offers innovative solutions with its high-performance plastics Durethan®, Pocan® and Tepex®. They can replace many metal applications in cars and, in doing so, help lower fuel consumption while ensuring maximum safety. Such plastics are already used today in the body and the interior of a vehicle, such as in engine mountings and seat components, as well as for fuel doors and door handles. 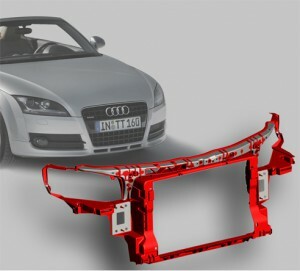 Lightweight design as a prospect for the future – this is something that car designers realized a long time ago. Electric cars with just one window consisting of a combination between the windshield, roof, and A-pillar, or vehicle parts made out of plastic that change colors when exposed to sunlight, are just some of the ideas long since envisaged. As a result, the environmentally compatible cars of tomorrow will have a thing or two to offer in the way of looks. And it’s all thanks to the cutting-edge materials of highly specialized companies like LANXESS that are already paving the way today to make this a reality. Durethan® and Pocan® are high-performance plastic materials on the rise, offering outstanding potential for growth and innovation. They also make a strong contribution to our High Performance Materials business unit. Thanks to efficient production facilities and intensive product and application development, the business unit is one of the most competitive providers in the field. The production of Durethan® and Pocan® is further supported by our manufacture of strategically relevant intermediate products.